People who walk regularly swear by the health and psychological benefits of their daily jaunt. Here are five reasons why they’re right. If you’ve ever gone out for a walk in a huff and come back more calm and collected, you know firsthand that walking can help reduce your response to a stressful event. Studies also confirm that walking benefits your mood by releasing your body’s natural happy drugs — endorphins. And you’ll be full of pride at your accomplishment, which helps increase your self-esteem. You’ll respect yourself more. 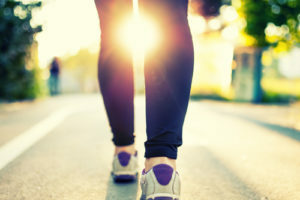 Walking is one of the best exercises for losing weight — it’s relatively easy to do (and easy on the joints), it’s free and you have to do it every day anyway. To start walking for fitness, try to begin with a 20-minute walk every day. If that’s too much, start smaller. But do set a goal of building to 30 minutes a day, every day. Once you mastered that, take your time increasing to a higher level. Never increase more than 10 percent more any one day than your maximum the prior week. Once you are ready, increase your goal to 10,000 steps a day (A pedometer will help — see item #4). Regular walkers have fewer heart attacks and strokes, lower blood pressure and higher levels of HDL (healthy cholesterol) than non-exercisers. Walking can lower blood pressure and LDL (lousy cholesterol), decrease the risk of many cancers and improve immune system function. Plus it improves quality of sleep and keeps you energized. Tracking your steps with a pedometer is key to walking success, says Michael F. Roizen, MD, Chair of Cleveland Clinic’s Wellness Institute and co-author of the audiobook YOU: On a Walk. People who love their pedometers logged a reported 2,000 more steps per day. To make your workout feel easier too, ask someone to join you. With a walking buddy, you’re bound to enjoy your workout more — and feel it less. Cravings in general are usually bad news for people trying to lose weight. Craved-for foods tend to be calorie-dense, fatty or sugary, with chocolate being the most commonly reported. Recent findings show that walking can curtail a hankering for chocolate, both during the walk and for about 10 minutes afterward. Says Professor Adrian Taylor of the University of Exeter, the scientist behind the study, the findings suggest that walking helps people lose weight by curbing cravings for sugary snacks.